When planning a corporate event, such as a product launch, annual conference or simply a knees up, providing a ‘favour’ or gift for your delegates to take away is a ‘must’. Your miniature personalised wine bottles will keep your brand alive in your delegates’ minds long after the event is over. 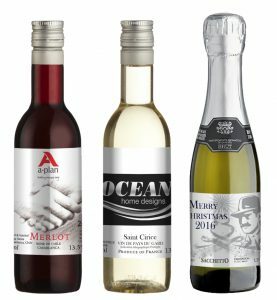 We will design you bespoke personalised wine labels using your branding and your messaging. ‘Single serve’ bottles tend to be 187ml in volume and there is a range to choose from. Please contact us if you would like some more info. 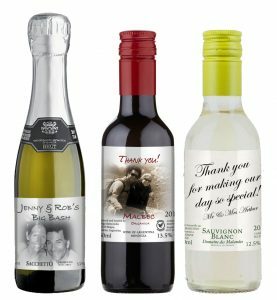 Add a little something to your big day with miniature personalised wine wedding favours. We will design your personalised wine bottle labels from scratch using your photographs and your messaging. Make your wedding day even more memorable for your guests by giving them each a personalised miniature bottle of wine to take home from the day. They can toast your good health whilst you are away on honeymoon! Pricing depends on wine choice and volume. Please contact us for more information.